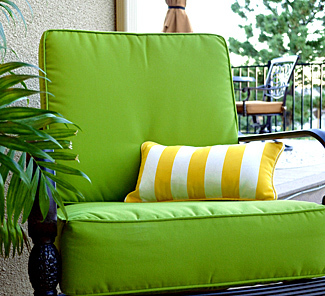 Custom-made deep seating cushions are a wonderful addition to any outdoor or indoor space. These are made with a thickness starting at 4" to 8" for optimal cushion comfort and support. 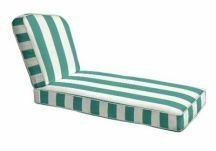 Deep seating cushions are great for teak chairs, wicker and cast iron furnishings. They also make a great sofa or love seat replacement cushion. Whether you plan to use them indoors or out, these will last many years. 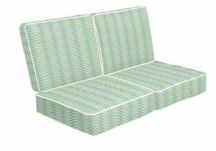 Let our visualization tool give you the option of seeing your deep seat cushion before you buy. 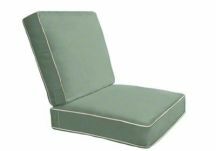 With hundreds of outdoor and indoor fabrics to choose from, you can custom create any deep seat cushion you need. Our custom-made deep seating cushions come with the choice of four fill options. Our Optimal Comfort inner fill is made with quality foam, MicroGel Memory foam and batting which is then placed inside a waterproof ticking;The ultimate choice in luxury for both indoor and outdoor applications. We have two types of indoor fill, either an indoor standard foam fill or a deluxe indoor fill which has a layer of one inch cumulous batting on top and bottom of our standard foam to create a crowned look. Both are ideal for inside the home. Our standard outdoor cumulous poly fiber fill allows water to drain through the cushion after a heavy downpour which makes another option for outdoor living spaces. Does your deep seating chair or sofa require a uniquely-shaped cushion? If you have a deep seating chair or sofa that is unique in shape from what we offer online, you will need to send us a template. 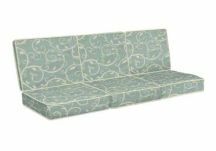 Our experienced workroom is able to make virtually any type of cushion but we do ask that you take accurate measurements to ensure you will get the ideal deep seating cushion for your client. At Designer Custom Source, we aim to exceed your expectations and hope you experience only the best in high quality, made in America satisfaction.